Just felt I need to see these people in one place so if you know of any other images labelled Tartarian in any of its forms or languages please add them here. In English: I. Tartar Lama. - III. Kalmak woman. II. Kalmak Tartar. - IV. Voluble wheel. - A. The dwelling of the Tartars. In English: VII. Figure of a northern Tartar facing. VIII. Mark the backside. Shown in the print is the Kangxi Emperor (; temple name: Shengzu which means "The Holy Lord" 4 May 1654 20 December 1722), who was on the throne at the time the print was published. He is referred to in the text as Yunchi, son of Xunchi (Sunzhi). He was the fourth emperor of the Qing Dynasty, the first to be born on Chinese soil south of the Pass (Beijing) and the second Qing emperor to rule over China proper, from 1661 to 1722. Une femme [Koko Nor Tartars, by Grueber. found a few here, along with other Russian customs, they are all about the same style. From the mid 1760s. Does anyone have the winter catalog of Tartarian clothes? Good topic to gather all kinds of pictures of them under a single thread. A couple of striking things come out to me from a few of those images. The Northern Tartarian women are depicted being around palm trees. They and the Tartar women from Erivan show some resemblance to what could even be seen as some modern day gypsy features. Also the woman with the fan resembles having clothes that remind me of some Chinese clothes, but not showing any modern day Asiatic feature in her. The 'new Hollander' just looks weird, but I remember seeing a map posted in this forum where there was an area of "New Holland" in the northern coast of Russia fairly close to Finland. Just can't remember the thread and post where I noticed the map and wondered about it. Even from these it is however quite clear that there has been a variety of people living in that area. Keep 'em coming. "Un Berger Tartar" Wood engraving ca 1880. "Le Lama des Tartares Mongols." Russia Taguri-Tartars antique print by Hogg 1782. The Komi people are cool simply because their coat of arms is the eagle looking dead at you. 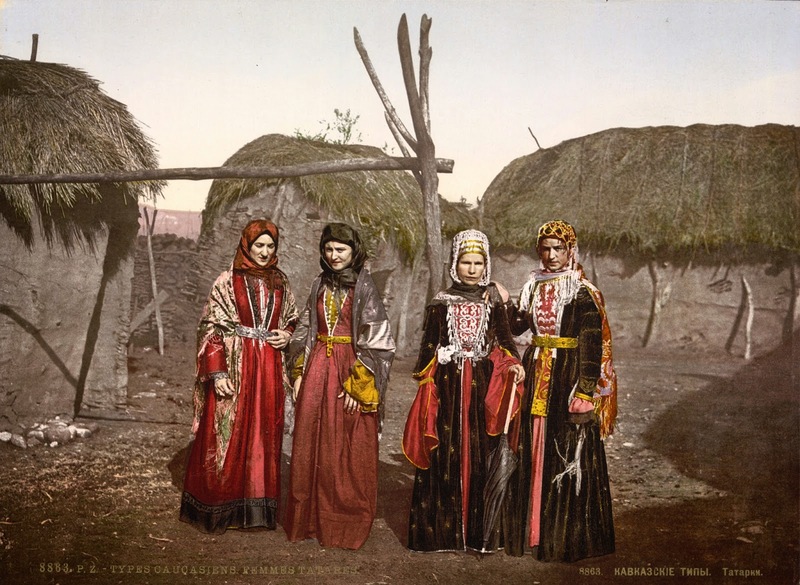 This plate shows different Tatar people in their local dress. From left to right; Uzbeks, Tatars of Casan and Bucharien. "I often see images on the Internet that are labeled "Tatar" or "Tartare" that are not of our people. In the 19th Century, Many peoples were erroneously called "Tatar". That's the Tartaria - and a lighter one - of another continent. Yeah, possible, that clothing or lack of it would fit the weather condition much better there. I just remembered a map from this forum on some thread where there was also a "New Holland" in the northern Russian coast, fairly close or a bit east to today's Arkhangelsk. The map was from the 17th or 18th century if I recall it right and it just stuck on my mind and found it fairly interesting. If someone finds it and there is some meat for the bones on that to be found, perhaps it could warrant it's own thread. There's also a "New Holland" island in St. Petersburgh apparently, but I guess this is taking it too far and is considered derailing from the topic, so I'll just leave it at if anyone finds anything more to the Dutch in Russia, then at least I'd be interested for an own thread or put it to my general questions and brainstorming thread. Found the map and the post, added here under this general topic to avoid derailing. Single Photo: "When Germany was Alemannia"